This model is valid CellML and appears to match the published equations. However the model will not run in either COR or OpenCell. ABSTRACT: In trypanosomes the first part of glycolysis takes place in specialized microbodies, the glycosomes. Most glycolytic enzymes of Trypanosoma brucei have been purified and characterized kinetically. In this paper a mathematical model of glycolysis in the bloodstream form of this organism is developed on the basis of all available kinetic data. The fluxes and the cytosolic metabolite concentrations as predicted by the model were in accordance with available data as measured in non-growing trypanosomes, both under aerobic and under anaerobic conditions. 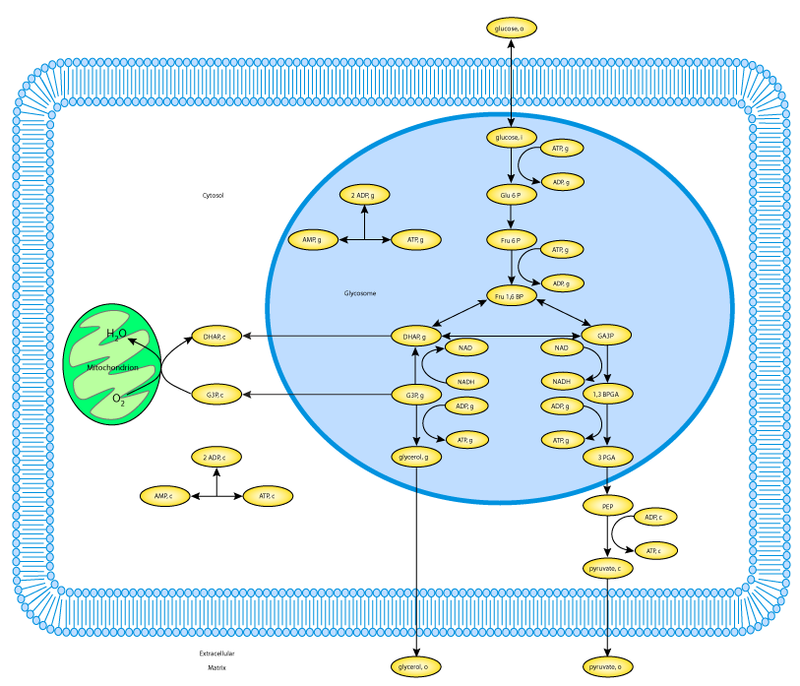 The model also reproduced the inhibition of anaerobic glycolysis by glycerol, although the amount of glycerol needed to inhibit glycolysis completely was lower than experimentally determined. At low extracellular glucose concentrations the intracellular glucose concentration remained very low, and only at 5 mM of extracellular glucose, free glucose started to accumulate intracellularly, in close agreement with experimental observations. This biphasic relation could be related to the large difference between the affinities of the glucose transporter and hexokinase for intracellular glucose. The calculated intraglycosomal metabolite concentrations demonstrated that enzymes that have been shown to be near-equilibrium in the cytosol must work far from equilibrium in the glycosome in order to maintain the high glycolytic flux in the latter. The stoichiometric scheme of the model of glycolysis in the bloodstream form of the parasite Trypanosoma brucei. Derived from workspace Bakker, Michels, Opperdoes, Westerhoff, 1997 at changeset 1ea755282ca0.